This week, the Dining Out Team went exploring the very busy Soi Diana and made contact with the Scandinavian community at Harry’s Hotel, Bar and Restaurant. Our host for the evening was not “Harry” but Toby, who explained that there were many Harry’s restaurants in Norway and Sweden, and for the local nationals “Harry” was chosen as it would remind them of home. Harry’s Hotel, Bar and Restaurant is about three quarters the way up Soi Diana from Second Road and just adjacent to the Metropole hotel on the left. It is an open restaurant on two sides, with the 32 room hotel above. Soi Diana is not a street with many parking spots, and with The Avenue parking station just round the corner we chose the security and cover at B. 20 per hour (or free with a stamp from one of the outlets there. 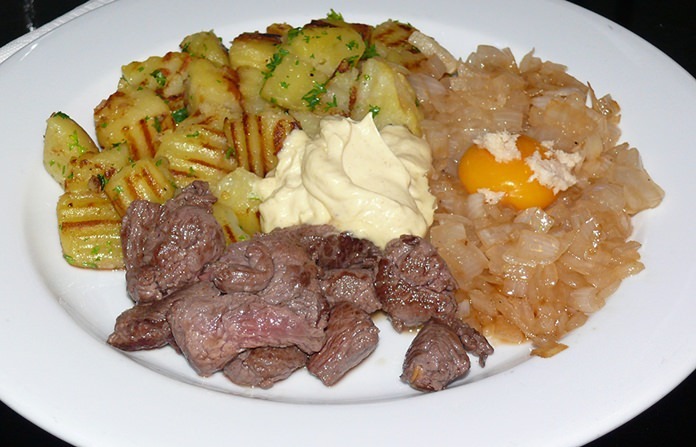 Beef Rydberg with Egg Yolk and Horseradish cream. The restaurant has wicker as the predominant décor with comfortable wicker chairs and cushions to stop you getting a wicker bottom! The staff are very obliging and happy with their green uniforms. But of course, the Skandi’s are well known for enjoying themselves. Much better than rolling around in the snow and being beaten with birch branches! Beers are inexpensive, with local brands B. 50-70. The menu begins with breakfasts, all day, every day, and includes American Breakfast, all day English Breakfast, Steak lovers Breakfast and simple Egg and Bacon. These range in price between B. 95–395. Dinner ranges between B. 265-395, and steaks B. 385-625 including Planked Pork Tenderloin (fläskfile’ planka), Pork Noisette w Fried Potatoes and Sauce Bearnaise (fläsknoisetter med stekt potatis and bearnaise), Chicken Herb, Idaho Potatoes and Tarragon Sauce (Baconlindad kycklingfile’ med dragonsås), Pork Tenderloin with Pepper Sauce and Idaho Potatoes (fläskfile’ med pepparsås and idahopotatis), Harrys Cheesburger w French Fries and Coleslaw, Harrys Original Ribs with French Fries and Coleslaw and Jack Daniels Glazed Ribs with French Fries and Coleslaw. As you can see, plenty to eat as well as the lessons in Scandinavian language. There are also daily specials at B. 195. Monday: Swedish Ground Beef w fried Onion and Gravy (Pannbiff m Lök and sky). Tuesday: Milk Stewed Macaroni w Swedish Sausage (Falukorv) (Falukorv m stuvade makaroner and råkostsallad). Wednesday: Swedish Hash with Fried Egg and Beetroot (Pytt i panna m tillbehör). 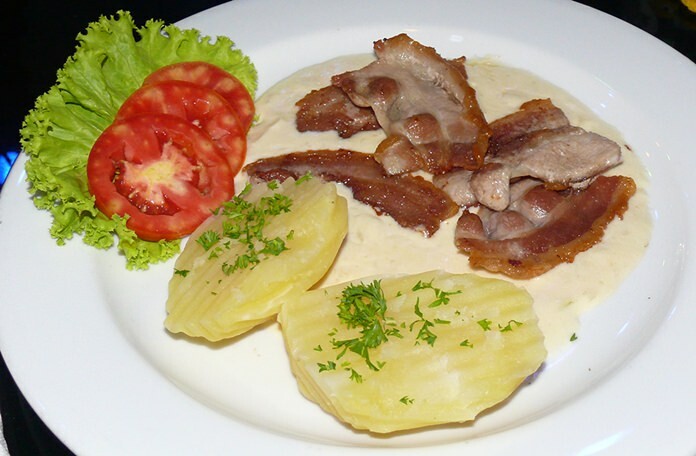 Thursday: Fried Pork w Onion Sauce and Potato (Stekt fläsk m löksås and kokt potatis). Friday: Schnitzel w French Fries and red wine sauce (Schnitzel m pommes frites and rödwinssås). Saturday and Sunday specials include a glass of wine or draught beer 295 baht. Madame chose the Beef Rydberg with Egg Yolk and Horseradish cream while I went for the Thursday special of Fried Pork with Onion Sauce and Potato. Both of us enjoyed the food, and the portion sizes were more than adequate. We had beers with our dinner, rather than wine. Toby said that their success has been built on “Good Price and Good Quality”. From what we could see, the food was good quality and the prices very reasonable. If you are looking for a Scandinavian meal, we can recommend Harrys. 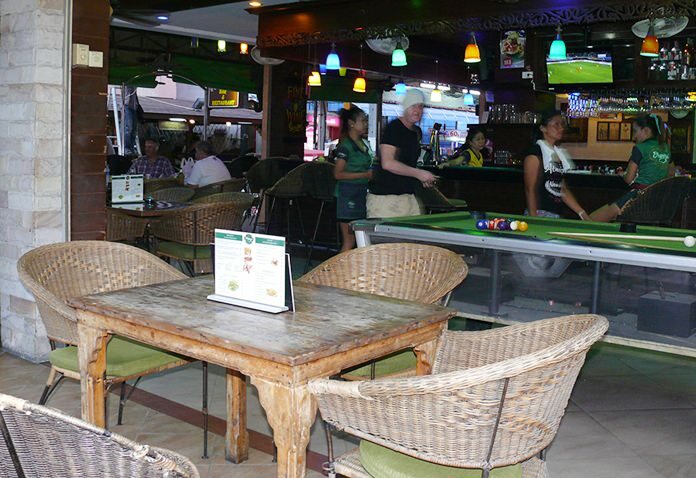 Pattaya, telephone +66 (0)38 429 683, email [email protected], open seven days kitchen 8 a.m. to 11 p.m. but bar open 24/24. Parking probably best in Second Road and walk up Soi Diana Inn or in Avenue at B. 20 per hour, or 5 hours free with shop stamp.